Eagle Inside a Killer Whale. Left side where the tail depicts the Eagle's tail feathers. This his the first piece signed with the artists Haida name. 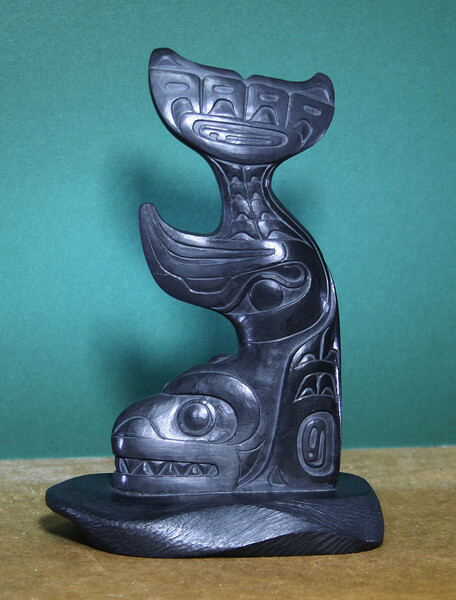 The Eagle is the primary crest of the old Haida Clan Chiefs who were the dominant ones in the village.This Argillite carving might represent the marriage of a couple where the Eagle is the primary crest and the Killer Whale the sub crest.